pizza first…and then a present a day from the 11th to the magical 26th. Karen is great…like Tony the Tiger. October and Halloween are upon us; we decorated the house, and the squirrels and raccoons carved the pumpkins. 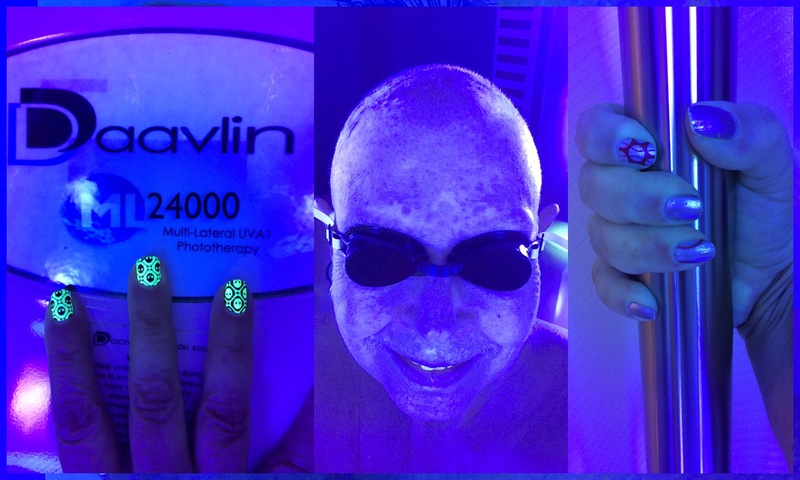 Well, actually we do – Karen continues her weekly UVA-1 treatments for GvHD. Hey, let’s stand in the ‘microwave’ of health… yes, I know it’s long wave for all the physicists…but you get the picture which hopefully she will post, the Blue (wo)man Maus! the Hat …if you dare…..
Posted in Bone Marrow Transplant, Head & Neck Cancer by Michael at Thursday, October 25th, 2018. You can leave a response, or trackback from your own site. The Beatles and I’ll stop while i’m ahead, happiest of birthdays with many more to come, enjoy! Hi kids endless shrimp is killing me! And maybe status quo. Miss you guys come kill me with endless!,, Thur fri sat sun 330-8 to be safe! Ps Josef took me out to a small dinner last week? Oh and the girls….Chrissy carol carol Brenda are doing drag bingo Monday at silver mining! “When I’m 64”, by The Beatles. I’m an old forgetful idiot! Not as old as you! Hope I make it to 64 just because!!! !